New stats from monitoring service StatCounter suggest that for the second time since its launch, Microsoft’s Bing has surpassed Yahoo Search as the second most used search engine in the United States. Shortly after publicly debuting the new service, Bing already jumped over Yahoo Search – if only for one day – which many attributed to the launch momentum. But Bing has proven to be a very solid product that many seem keen to try out even after a month. 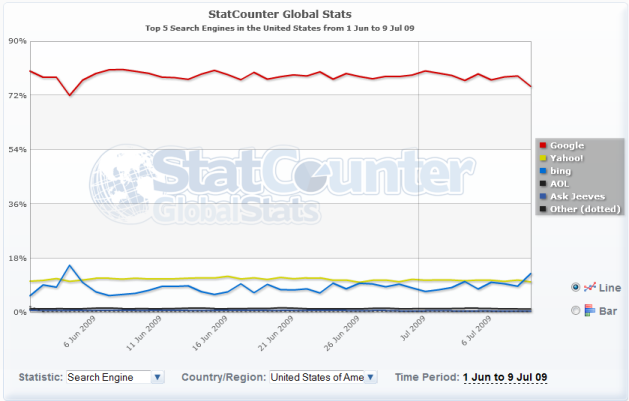 According to the new data, Bing took 12.9% of the US market like comScore had earlier measured. With the strong jump, Bing comes out ahead of Yahoo Search (10.15%), while Mountain View remains the undisputed king of the mountain with a US market share of 75%. StatCounter CEO Aodhan Cullen comments on the leapfrogging of Yahoo Search by Bing, saying: “The jump in Bing’s share may reflect a positive review of the search engine compared to Google which appeared online in the New York Times on the 8th and in the print version on the 9th July.” I’m not really sure if that is in fact the reason and if this isn’t just the service’s regular growth path. After all, Microsoft has shown a remarkable drive to keep the momentum for its decision engine going, recently adding Twitter messages to search results and bringing the search platform to its Hotmail service. Surely one newspaper article can’t be the only reason for its steady rise in share? In any event, while Google shouldn’t be particularly worried about losing its dominance on the search market yet, the other players in the field better be watching Bing’s progress very closely. Microsoft is doing it right, and users are noticing, too.